A view of the berm side of the culvert at mile 64.68. 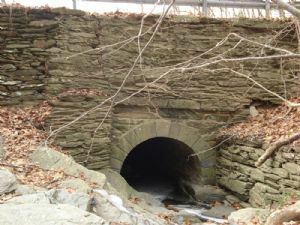 Historic culvert 96 at Sawmill Run. 8 foot span rebuilt in 1980. The Culvert carries Sawmill Run. The berm portal of this culvert appears to have had at least three additions. Washington County (Md. ); Chesapeake and Ohio Canal (Md. ); Chesapeake and Ohio Canal (Md. ), History, Pictorial works.